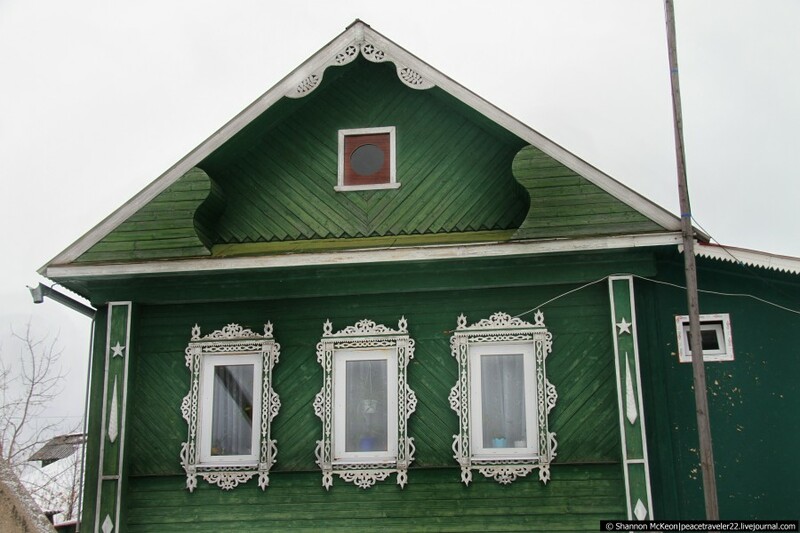 Where are the most well kept, colorful and orderly homes in Russia? 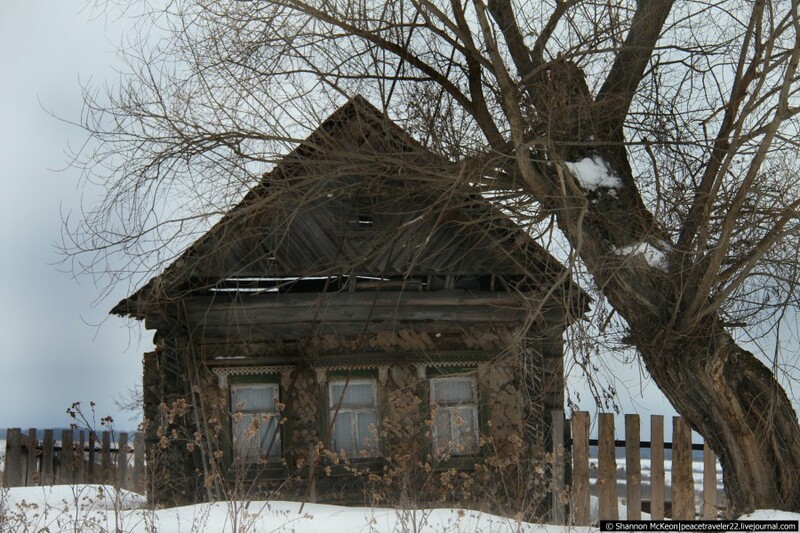 I don't mean mansions or dachas, but ordinary houses that are the primary living space for the occupants. Over the weekend, I began to process a lot of photos from the last winter journey and it's difficult to pick the city with the most vibrant and charming homes. In recent posts, I've shown only a few depressing and grey towns from the last journey, namely, Vologda and Ivanovo. In the upcoming stories, you'll see the opposite. Vibrant life, cleaner roads, and beautiful winter landscapes that immediately delight the eyes. Why are some cities so clean and pleasant and others dirty and gloomy? Is it the residents that live there, the financial resources of the local administration, or something else? Each of these towns is dealing with the same weather conditions, the same snow and the same ice. Can you guess the town pictured here and in the photos after the cut? 1. I don't know which color is most eye catching - green, blue or yellow? I like them all, and especially this house with the green plants and colored pots nicely placed in the windows. 2. 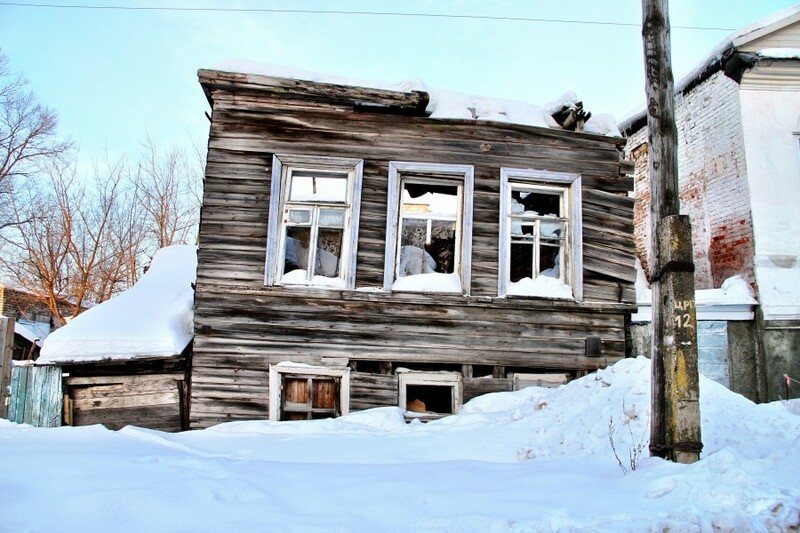 Even in this town, there are some homes which appear to be abandoned, but they are not as apocalyptic as the sunken, destroyed homes I saw all over Central Russia. No busted windows, broken fences or collapsed roofs. 3. Compare with this, from my first trip to Russia. Have you been to Yaroslavl'? My favorite Russian town, very well-preserved. Yes, it was the final stop of our last journey on the way back to Moscow. But, I was a bad girl in this city. It was the only night of the trip I drank, and the following day I paid the price. There was not much time or enthusiasm to fully see the city with the throbbing head and massive hangover. 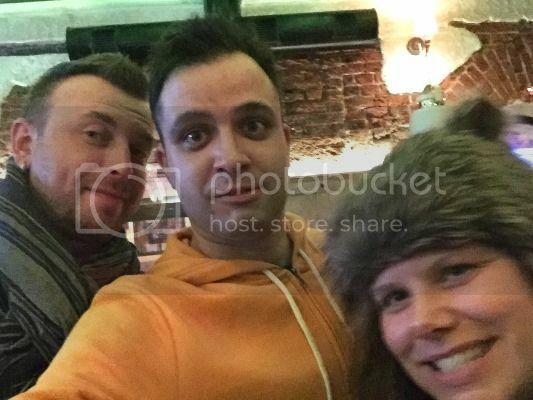 This is the last thing I remember - about 1 a.m., in the final bar with Alexander (macos) and Peter (lovigin). :)) But I did walk around the city with a local. Just too lazy to take photos. If you don't want to open the location of the place, you have to hide the license plate numbers on the pictures. I saw the license plate, and checked the numbers online. But the car is not from the nice city. The plate is from Ivanovo, right? Do you live in the village or a big city? it could be everywhere. this is a typical house for many regions in a typical condition. russia is not only ruins. not more than 40%. i'm sorry for my english. 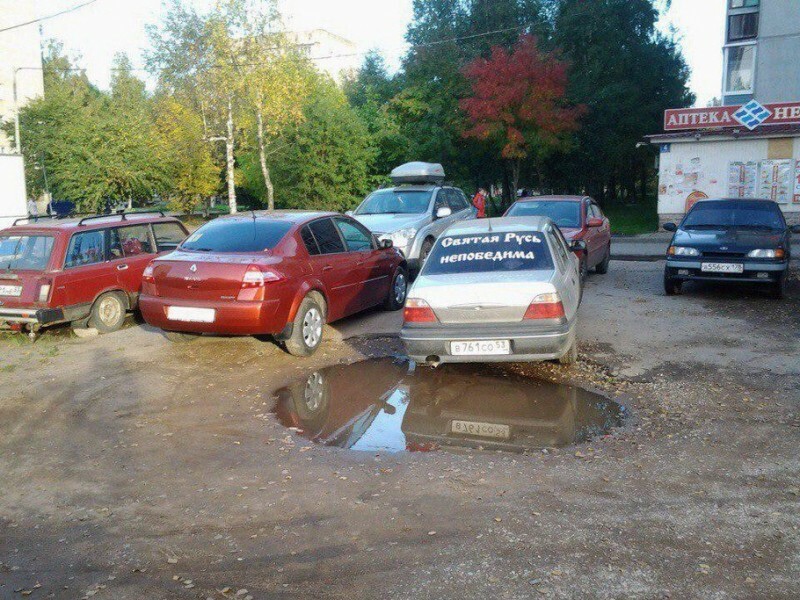 In Russia, everything is much better! 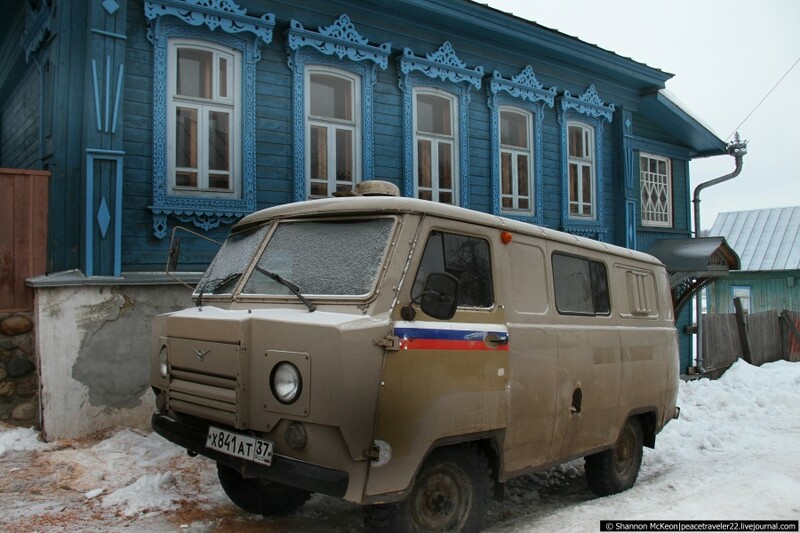 Good day, when the wooden architecture used to be spread all over Russia. Unfortunately, now it is not saved, and even on the contrary is destroyed. There is extraordinarily beautiful wooden architecture of the northern regions, the territory of the "Small Golden Ring" cities, and the period of development of Siberia. I've visited a lot of cities around the Golden Ring, and love this colorful, wooden architecture. But in some places it's very poorly preserved. I have not yet made it Siberia. Hopefully next year. Armored Post truck on the first pic? I don't know what this truck is? I wondered the same. Is it just a patriot with the flag on his car, or some type of official truck? 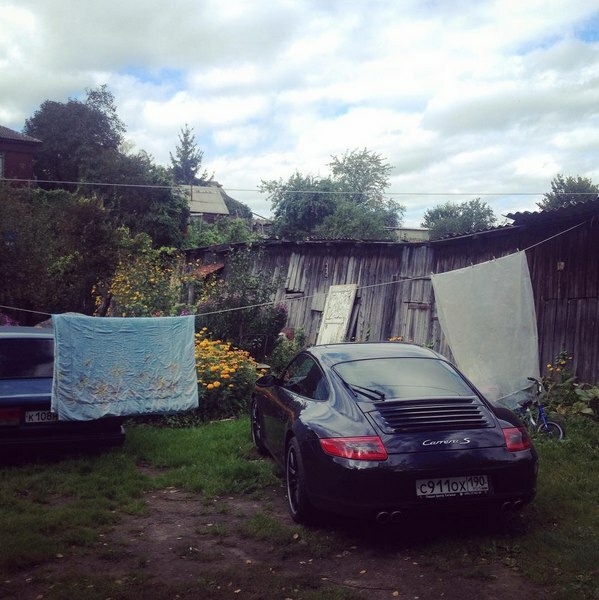 You have seen typical small towns of central Russia, with a lot of old privately own houses and depressed economy. Large russian cities usually looks more modern and developed. This city looks nice, but I haven't traveled to the Urals yet. I have a lot of readers there who constantly invite me, so perhaps it's time to put this city on the "to do" list. Actually in Russia you can find a lot of small towns with the same houses. It could be Plyos or Yuzha or Gavrilov Posad or Yuryevets or Puchezh (in Ivanovo region). I think Plyos. I was in Yuryevets, it wasn't so colorful or nice. At least not the places I saw. You mentioned before 2 towns that you liked: Ples and Soligalich. Soligalich is in Kostroma oblast but the license plate of the car is from Ivanovo oblast and this is not a private car. It's an armored cash transporter. So it must be Ples. The small house in Kunar is fabulous!! In this region, I've only seen Kazan. Unfortunately, I walked only in the main part of the city, not the suburbs or local villages. But Kazan is very nice! The destroyed houses are not inhabited. Why write that these people live? I didn't say people lived in the destroyed houses. But they should be demolished, or removed. They are a blight and eye sore on the Russian landscape. Are you really living in Crimea, as it says in your profile?